Dear readers, sometimes dreams do come true! 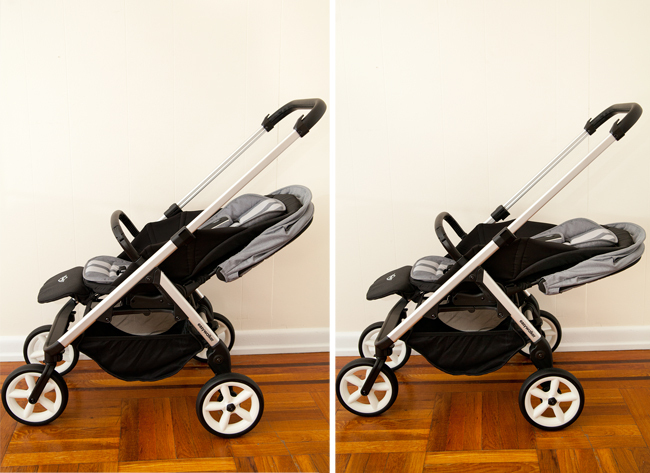 For a long time I've been hoping to get my hands on a stroller by a Dutch brand Easywalker. 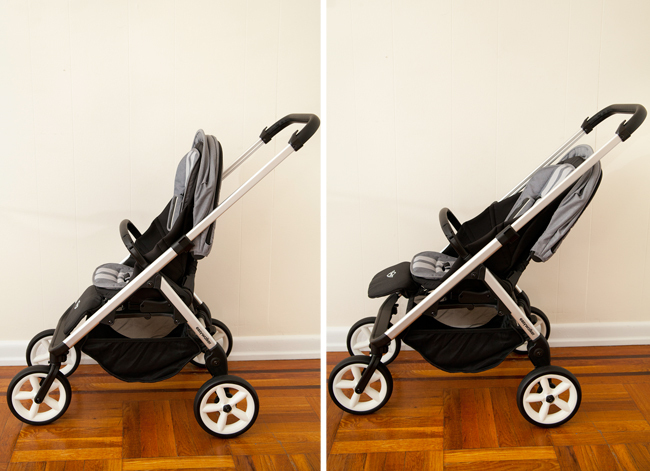 In an absolutely magical twist of fate, which makes me feel like stroller Cinderella, I was sent the 2015 Easywalker Mini stroller by Babyjungle.nl for a review. 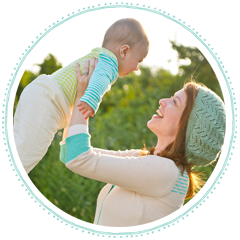 Babyjungle is located in the Netherlands and ships their products world-wide. If you're not familiar with Easywalker, the brand was founded in Amsterdam in 1989 by René Floore who designed the very first award winning 3-wheel stroller in Europe. Over the years, Easywalker evolved, offering parents cleverly designed, high quality and easy to use products which are sold in 42 countries. 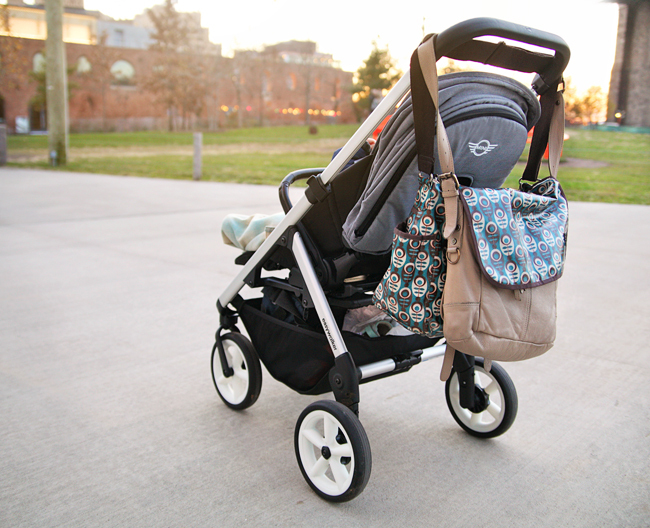 I am absolutely thrilled for the opportunity to test out and review the new Mini/Mosey stroller. Of course, as always, all the opinions are entirely my own. The Easywalker Mini is a compact stroller with a small footprint, packed with all the full-size stroller features you'll want for everyday use. It is a very attractive and refined looking stroller that fits perfectly into the Urban lifestyle. The Mini is very versatile, and can be used in three different configurations: with reversible seat unit, an infant carrycot, or as a travel system with car seat adapters. 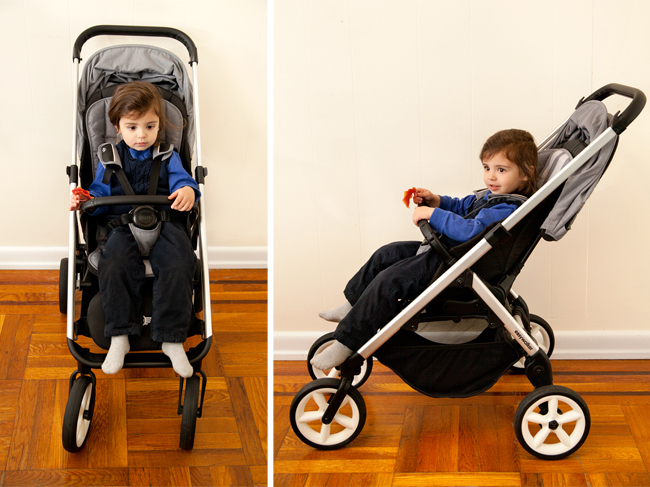 Easywalker Mini and Mosey are identical strollers that share the same chassis and functions. The only difference between the two is in the designer details and textile options. 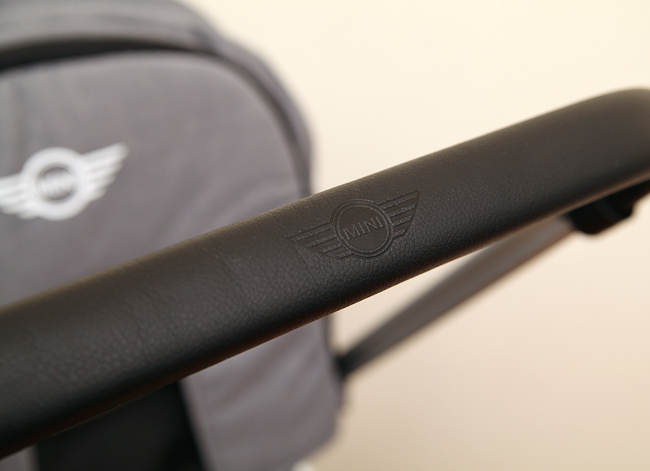 The Mini stroller is designed with iconic Mini Cooper logo and details which appear on the handlebar, leg rest, harness straps covers and seat liner. The Mini is available with black or silver frame and in a choice of black or white wheels. For the past few weeks, I've tested the Mini stroller out with my little helpers, ages 1 and 3. We took the Mini for long walks in Prospect Park, where we had the chance to push it off-road, went shopping with it and used it for daily outings. I think at this point we've gotten to know this stroller pretty well and so I'm here to tell you all about it. 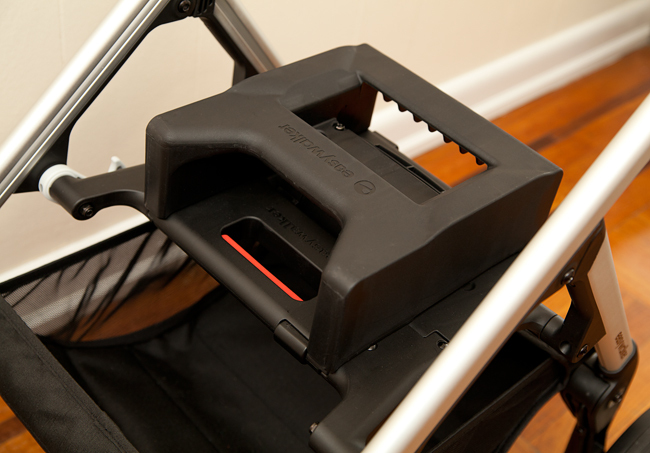 The Easywalker Mini has a really great seat unit that is comfortable for infants and toddlers alike. The seat is reversible, allowing your child to face the parent or the world. It clicks into a plastic platform on the frame. 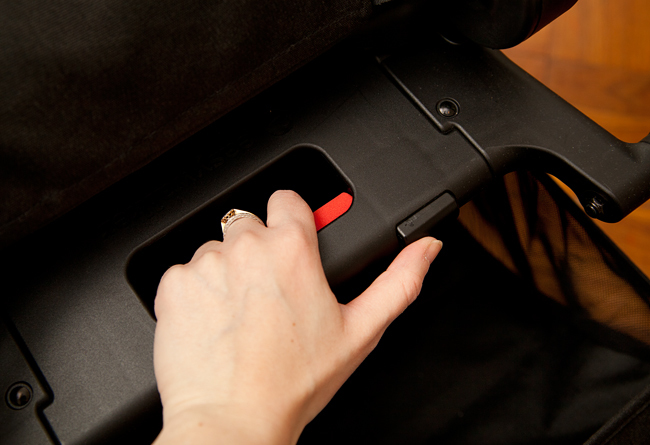 To released the seat from frame, you pull on a red lever, located between the seat and the leg rest. The lever can only be accessed when the leg rest is in the down position. Once the seat is released, you can turn it around and click it back into the platform. I find this system to be easier than what's commonly found on other strollers, where you need to push two buttons simultaneously on either side in order to reverse the seat. The Mini has one of the tallest seat backs I've seen, measuring 53 cm! 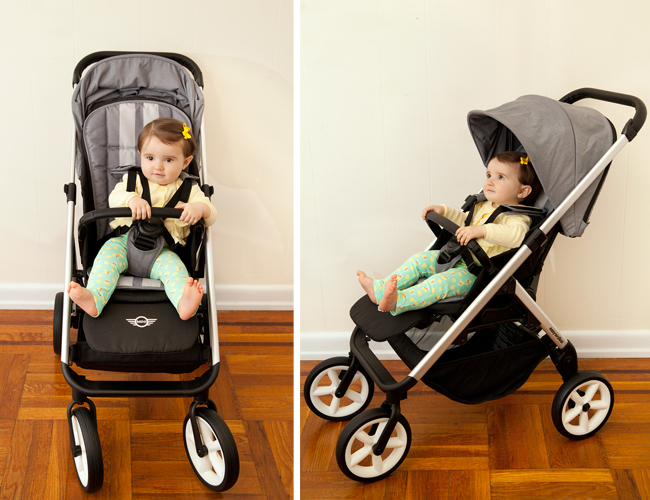 Together with the stroller's generous maximum weight capacity of 20 kg, it ensures good fit for toddlers as well as infants. While my 3 year old son grew out off a bunch of other strollers height-wise, he still has room to spare in the Mini. The backrest adjusts to 4 positions, including completely upright and completely flat. 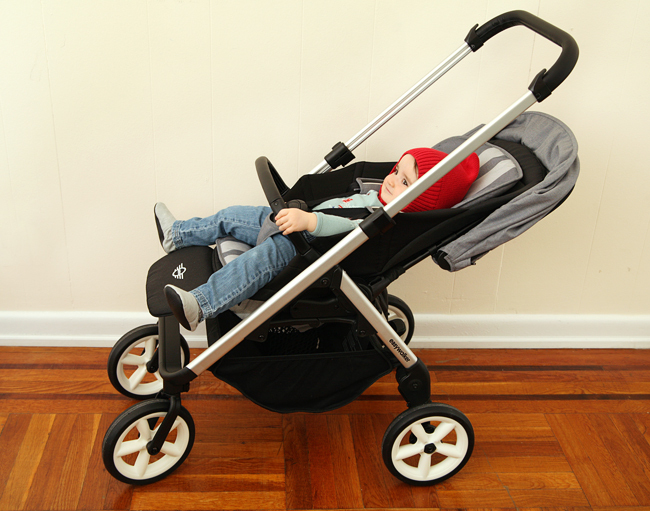 The completely upright position is at almost 90°, which is more upright than on most strollers. Some kids hate leaning back in the stroller and prefer to ride this way. As I mentioned in my other reviews, I love when the backrest adjusts independently of the seat portion, as it does on this stroller, creating a truly flat, bed like sleeping surface. The recline is achieved with one hand, by squeezing together two metal rods in the back of the seat. While this system is convenient, the rods make a slight clicking noise when squeezed. 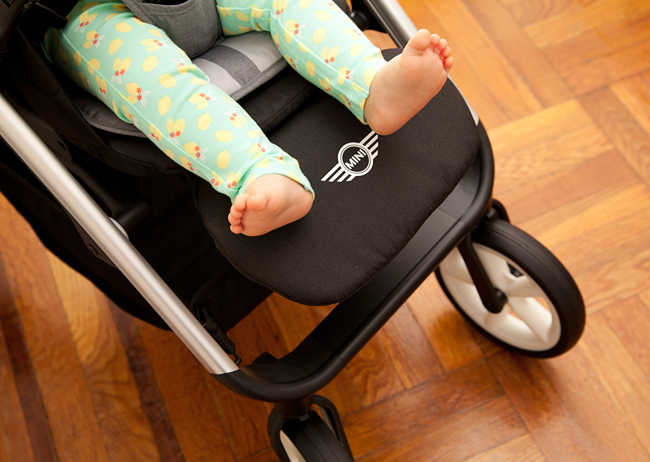 A reversible seat liner is included with the stroller and you can purchase replacement liners in a variety of colors to update your stroller's look. The seat comes with a leatherette covered bumper bar which has gate opening on both sides. 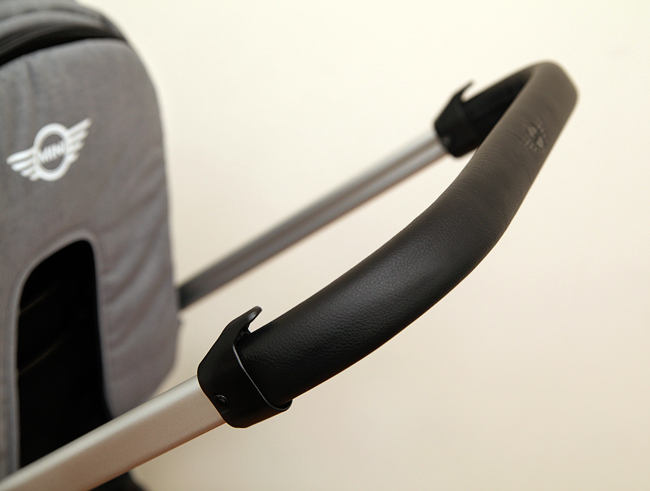 The bumper bar swings away for easy access to the seat and can be removed entirely. I think this bumper bar is a little closer to the seat than on other strollers, which might make older kids feel a little cramped in. Of course, if that's the case, you can remove it altogether. The Mini also has a built in leg rest which adjusts to 2 positions. The shape of the leg rest is different from what I'm used to seeing. Even when it's in the upright position, it is not completely flat but curves downward somewhat, in the style of reclining easy-chairs. It seems comfortable for Little Missy, but when I tried it with Ben, the leg rest sagged under the weight of his legs. I'm glad that the leg rest is there, but I wish it was sturdier and had the ability to be adjusted slightly upward to provide more support. The Easywalker Mini has an incredibly cool canopy. It sits on rails behind the seat and can be moved higher up to accommodate taller kids, or down to provide more shade for a smaller baby. It can also be tucked neatly out of the way behind the seat. I think this feature is pretty unique and convenient. The canopy has a flip out visor and also and extra zip out extension. While the canopy is not lined, it does offer UV protection and is rated UPF 50+. The one thing that unfortunately was left out of this awesome canopy is a peekaboo window. 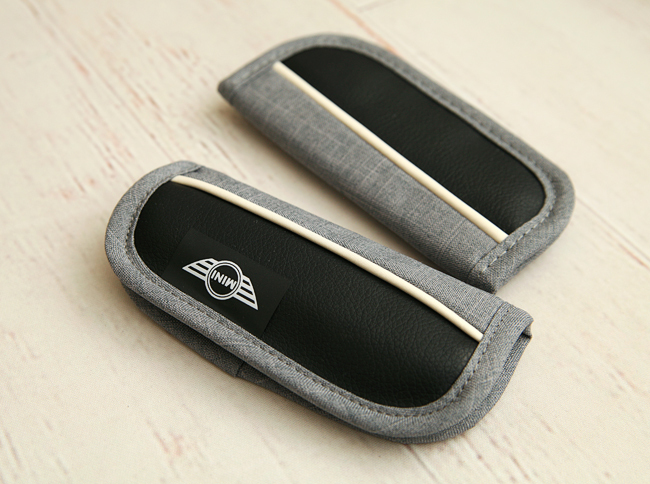 From the leatherette details to canopy and seat textiles, everything on the Mini has a consistent, top-quality feel. The fabrics are beautiful and durable, just as I would expect from a high-end brand. The Moonwalk Grey version is a heather grey with a subtle texture. 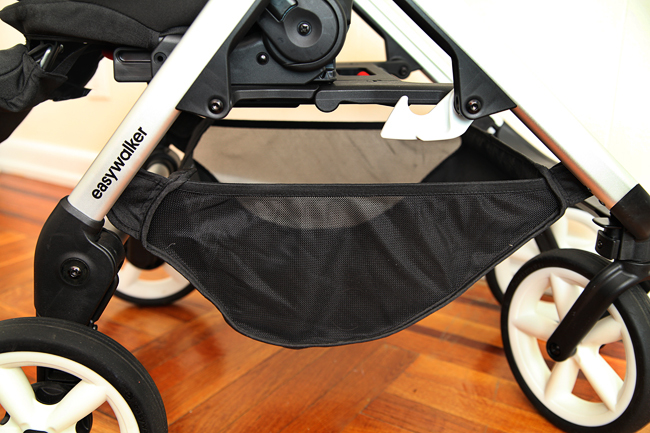 The fabrics are washable, but Easywalker recommends washing the canopy by hand to prevent damaging the UV coating. 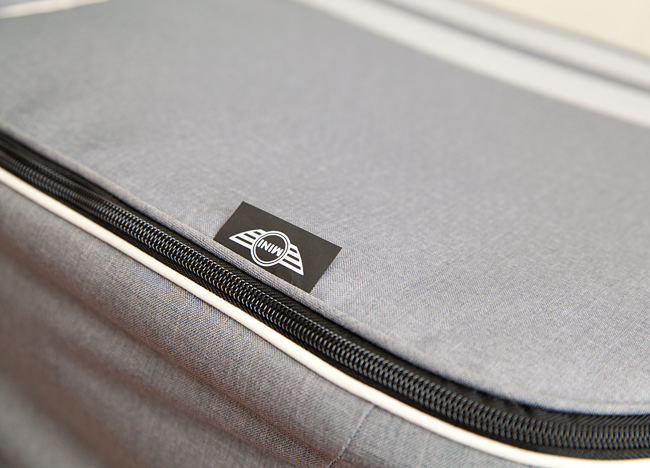 Mini is available in 5 color/design options, Union Jack, Black Jack, Pepper Jack White, Moonwalk Grey and Ice Blue. 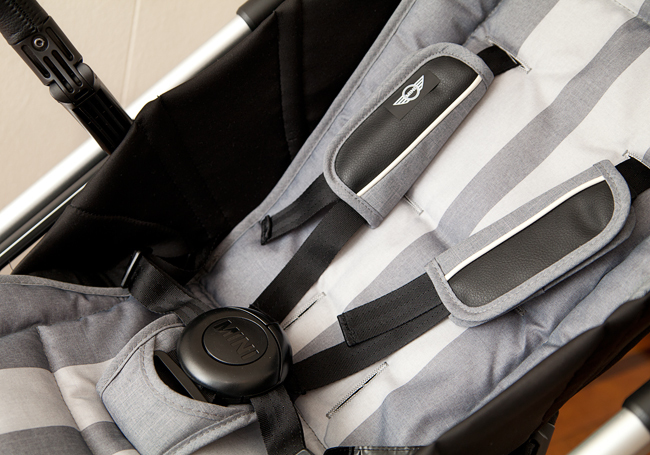 Replacement design sets can be purchased, giving you the option of changing the look of your stroller. The Mosey canopies and seat liners can also be used with Mini and vise versa. The Mini has a 5-point harness that is long and easy to adjust. The shoulder straps and the lower straps are connected, making it impossible to use the harness as a 3-point for older kids. The buckle is chunky and designed as a puzzle piece; two upper clips need to be aligned together before inserting them into the crotch clasp. I really like the attractive harness straps pads which have a leatherette panel, decorative piping and the Mini logo. The pads are made with a little hidden elastic which prevents them from slipping down. It's a small detail but it makes a difference. 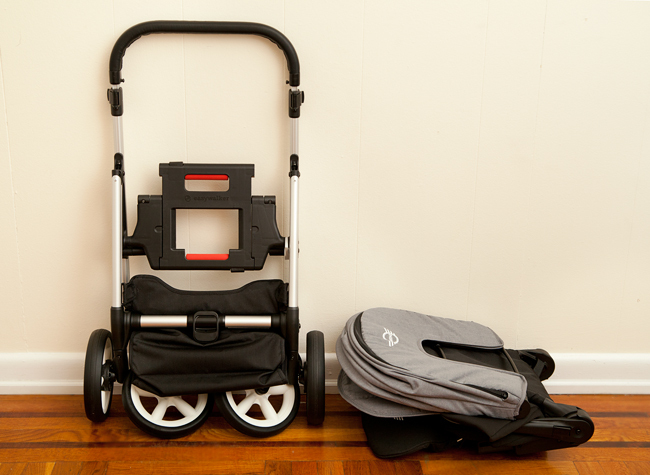 The wheels are 21cm (8 inch), which is pretty large for a compact stroller. They are rubber, filled with foam. The wheels have a quick-release mechanism and can be popped on and off in a matter of seconds. 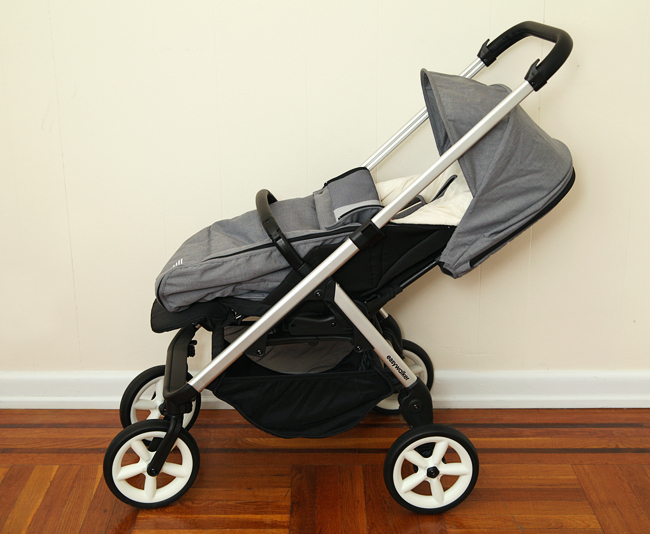 Because of the generous wheel size, the stroller never stumbles and plows through pretty much anything. I ran it over major cracks in the pavement, as well as wood chips in the park and even some small tree roots and the Mini never faltered. My kids' nanny, who's used to pushing our umbrella-stroller remarked how much easier her outings with the kids became ever since the Mini joined our ranks. I guess the brand is called 'Easywalker' for a reason. Another thing I really like about the Mini's rubber wheels is that they don't make any noise against the pavement. The Mini stroller is a pleasure to push! It's is very responsive, maneuvers easily with one hand and turns on a dime. I took it to Target and was able to effortlessly push the stroller with my left hand, while pushing the shopping cart with my right. I felt like Super Woman! 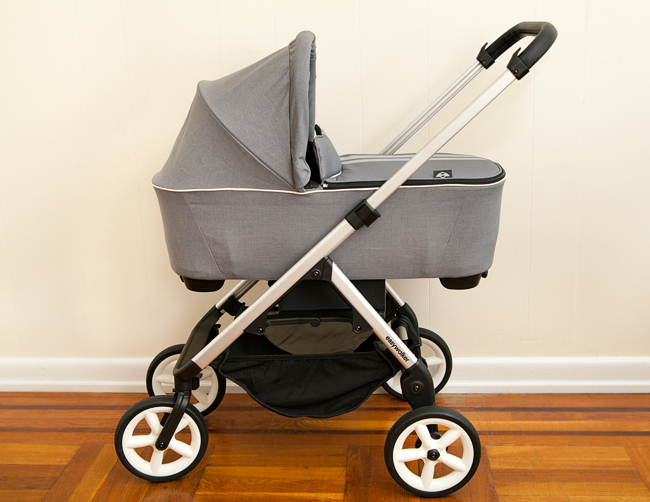 Because the stroller is only 54.5cm (21 inches) wide, it's really easy to wind it in and out of store isles. I never feel in anyone's way with my Mini, which is a good feeling. For those of you concerned about the stroller's 'curb-pop', I have good news. This updated Mini has no problems with jumping up on a curb, even when fully loaded with child and shopping bags. The Mini's 2013 predecessor had a hard time with curbs, but the stroller has been redesigned for 2015 with better weight distribution. Simply pressing on the handlebar will raise the front wheels. At the same time, the Mini is a very stable stroller and will not tip over even when you hang a few bags off the bumper bar. The Easywalker Mini is an incredibly good push on pavement and moderate terrain. As I mentioned before, the rubbed wheels don't make any noise and the push is smooth and effortless. 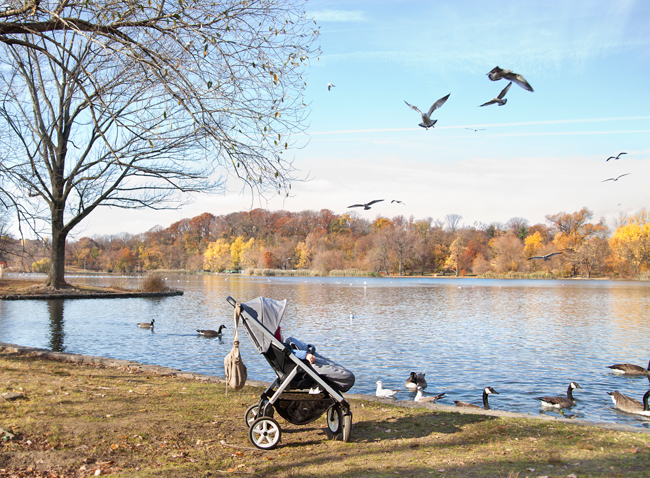 I took the Mini to the park to test it off-road and while it certainly performs and doesn't stumble, the stroller trembles, making the ride quite bumpy. I think if Mini had softer suspension, or pneumatic wheels, this would not be an issue. 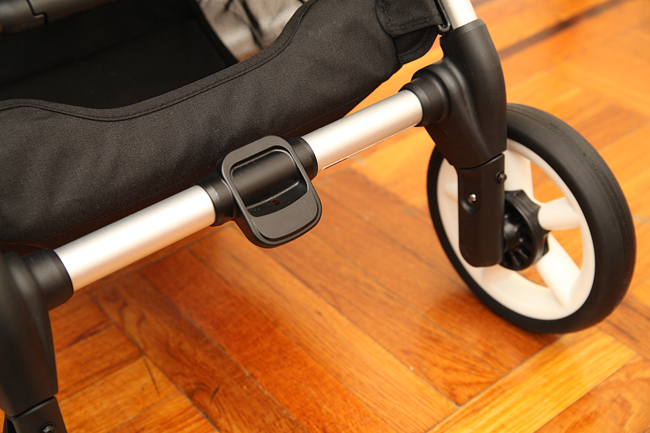 I wish that Easywalker would offer optional air filled tires for this stroller, similar to the tires on the 2013 Mini. 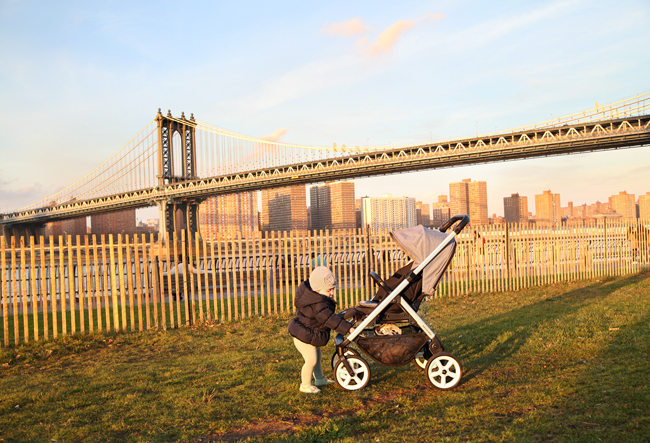 As is, the Mini is an excellent urban stroller which does have off-road capabilities. I absolutely love the handlebar on the Mini! 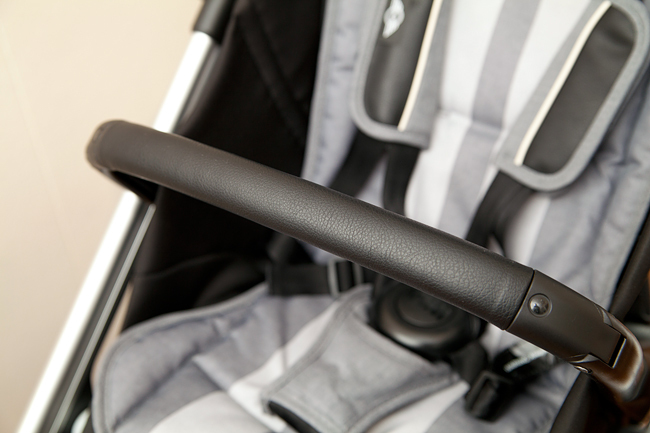 It is telescopic and can be adjusted by opening two clips on either side and pulling up, similar to the way handlebars adjust on Bugaboo strollers. What makes this particular handlebar unique is that it can be pushed all the way in against the bumper bar! This is very convenient when you find yourself in tight spaces like an elevator or on public transportation. The handle portion is covered in leatherette with etched in Mini logo. Another thing which I really appreciate about this handlebar is that even when extended, there's absolutely no wiggle like on so many other strollers. It's very strong and sturdy and even when loaded with shopping bags, the handlebar does not budge. 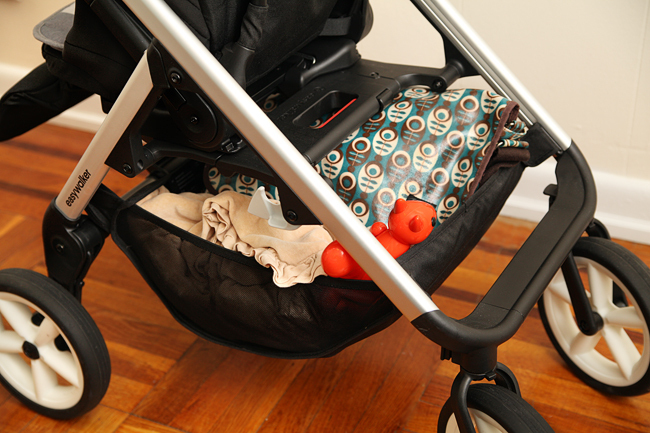 Speaking of loading, the handle has two small built in hooks for hanging a diaper bag or a purse. I love how they thought of everything! At first glance the basket does not seem very large, but these appearances are deceptive. I was pleasantly surprised to find that the basket actually holds much more than I initially thought. It reminds me of Mary Poppins magic carpet bag. You don't think it can fit much and voila! She pulls out a coat hanger :-). Since the seat rests on a platform over the basket, access to the basket is slightly tricky. 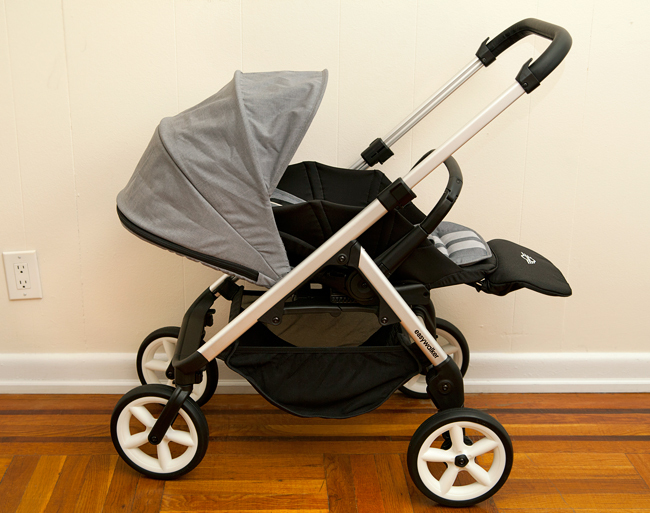 When the seat unit is parent facing, the basket is easier to get to from the back of the stroller or from the sides. The elasticized side walls can be pushed down, making it easier to stuff your belongings inside. The Mini folds with the seat facing in either direction. 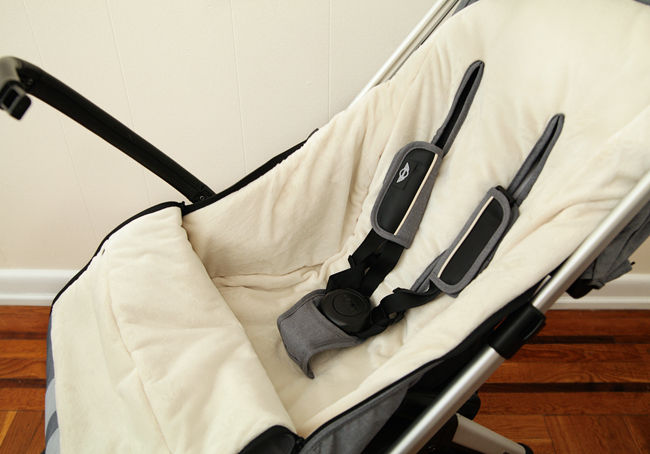 The fold requires three steps: first you need to collapse the seat forward by squeezing the recline rods in the back. Then you need to push the handlebar all the way down to it's shortest length and finally pull on a red handle under the seat, while simultaneously pressing on a little black button with your thumb. The process is the same in either direction. Another option is to remove the seat from the frame and fold the two separately for more compact storage. You do need to make sure that the front wheels are facing forward before folding, otherwise the stroller does not collapse all the way. 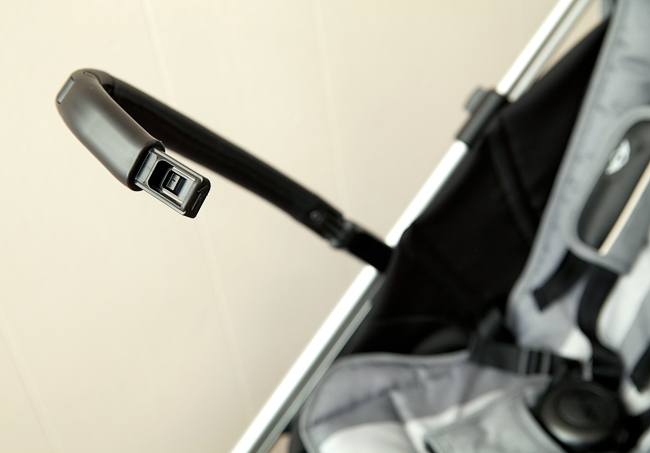 There's an automatic lock which keeps the stroller folded. I do wish the stroller would stand while folded. I feel like so many comparable strollers have a standing fold that it's a bit disappointing this feature is missing on the Mini. The break is a small pedal located in the center between the rear wheels. When pressed down, the break pushes steel pins into the wheel cogs. It makes a clicking sound when engaged and lifted. When the break is activated, the stroller still has a bit of a wiggle to it. Obviously it won't roll, but the wiggle is there. When the seat is rear facing and the leg rest is extended, the break is blocked from view. You have to fumble for it with your foot. I guess in the grand scheme of things it's not such a big deal, but I wish the seat would sit a little further back on the frame when rear facing. 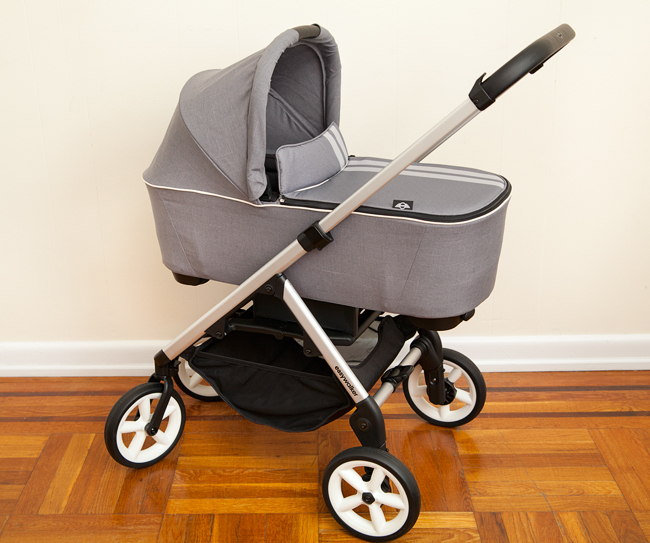 Easywalker also has an option of a gorgeous infant carrycot for the Mini stroller. 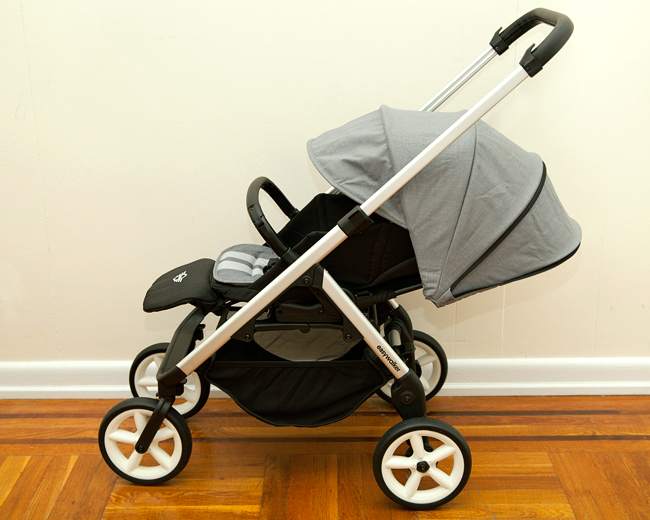 It is available in the same colors as the stroller, as well as in Mosey colors. 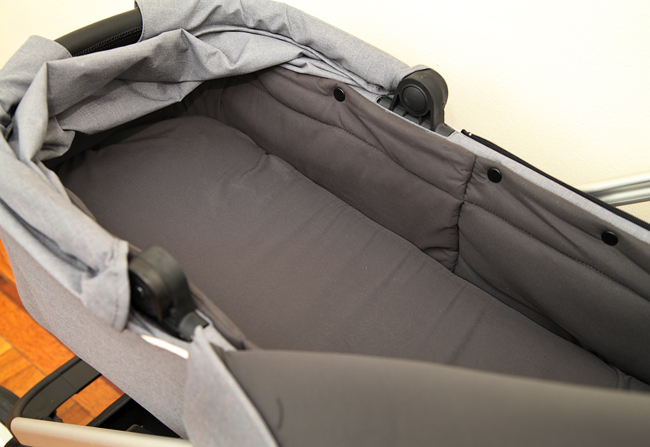 The carrycot is suitable for infants up to 6 months (9kg). Obviously when the baby learns to sit up on his own, it is not safe to put him in a carrycot. Little Missy, is too old for the carrycot but she actually still fits lengthwise. The inner dimensions are 13" x 30" inches. 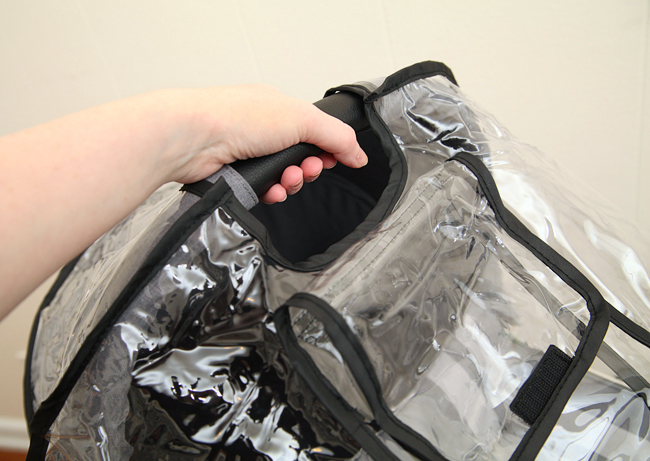 The carrycot has a zip-off cover with a standing storm flap. Inside, it's lined in very soft, smooth fabric that resembles silk. This lining can be easily snapped off for cleaning. 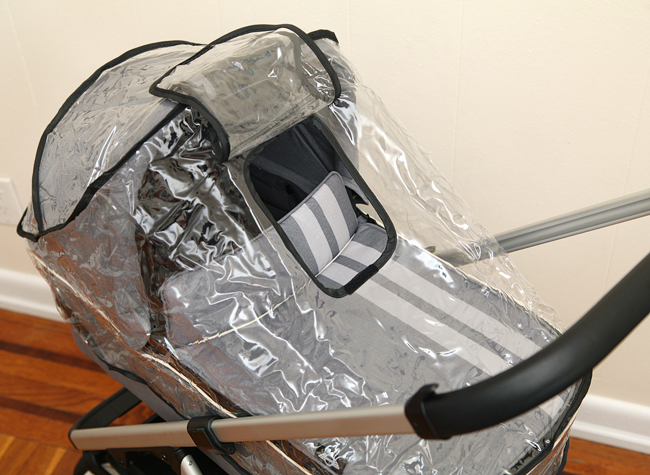 A rain cover and mosquito net are included in a set with the carrycot. 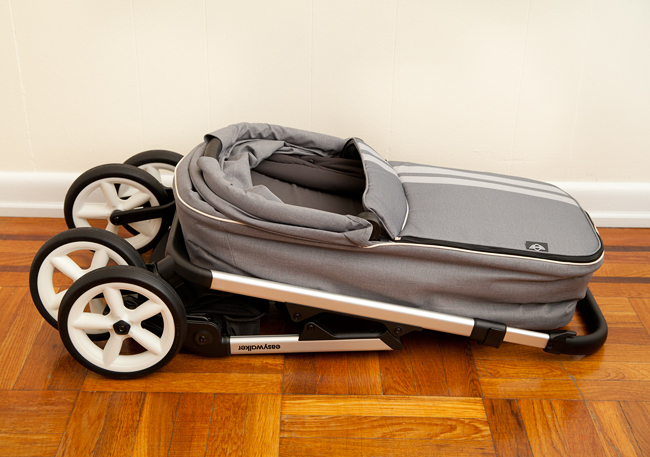 There are two options in attaching the carrycot to the chassis. You can either click it directly into the frame, or you can use an included platform under the carrycot to have it sit higher up on the frame. 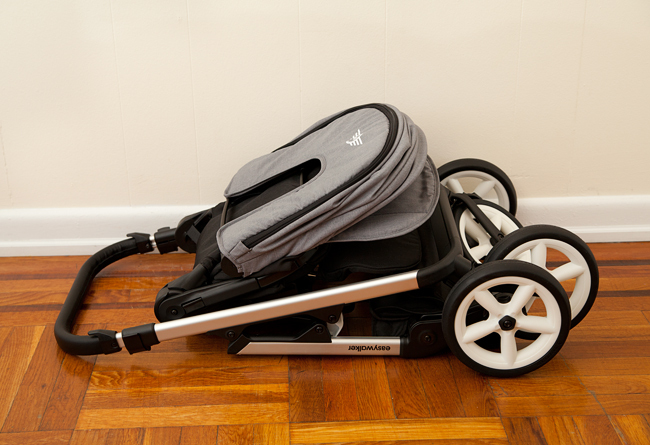 What's really cool and unique about this carrycot, is that it doesn't need to be removed from the stroller chassis for folding. 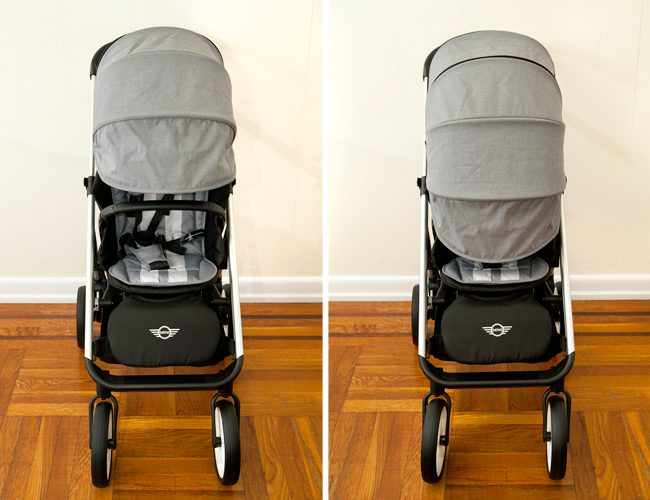 You can fold the stroller together with the carrycot on! I think it's a really neat feature. There are are two grips attached to the bottom. 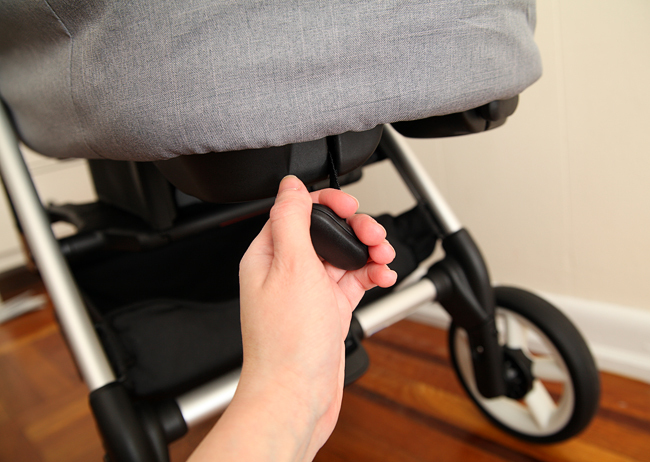 Pulling on the left grip will collapse the carrycot flat for folding. Pulling on the right grip will make rigid again. I told my husband, I love this carrycot so much, we might have to have another baby just so I can put it to good use! 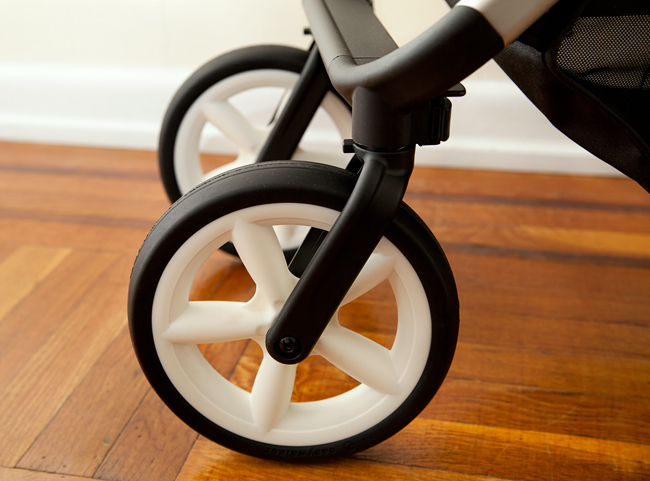 Easywalker offers various accessories for the Mini and Mosey strollers. One of the accessories I think is really great to have is a matching footmuff. 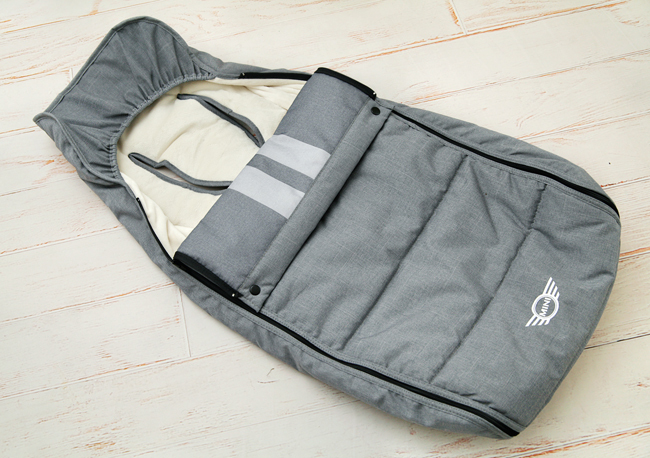 It's made with the same fabric as on the canopy and seat liner and lined with soft, plush fleece. The footmuff has universal slits for a 5-point harness. 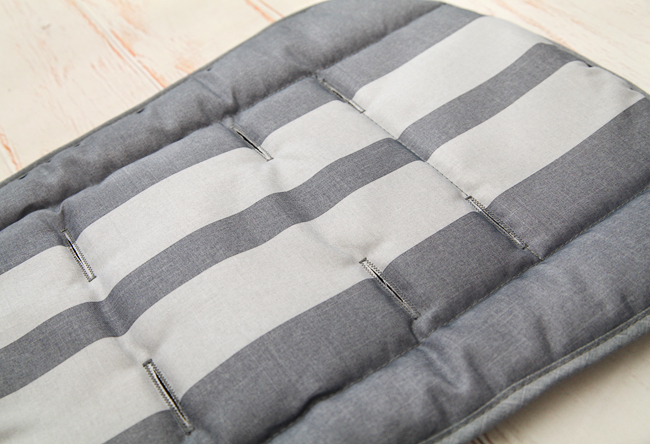 There are also snaps, so you can fold down the upper portion of the cover and keep it in place. I used the footmuff on a chilly day in the park and it kept Little Missy warm and cozy. Other available accessories include car seat adapters, rain cover, mosquito net, sun parasol, seat liners, Mini stroller design sets, travel case and an extra large shopping bag which attaches to the handlebar. I think the Easywalker Mini is quite unique, being a hybrid of compactness and functionality. 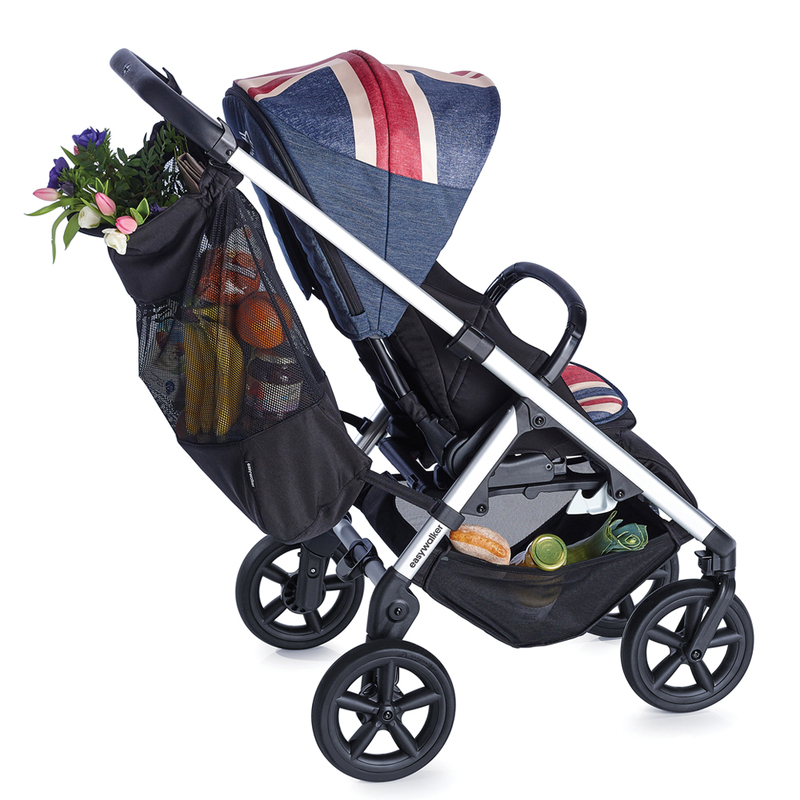 The Mini is an extremely agile stroller that is a pleasure to push. It is very attractive without being pretentious. I love the clean, sophisticated design! 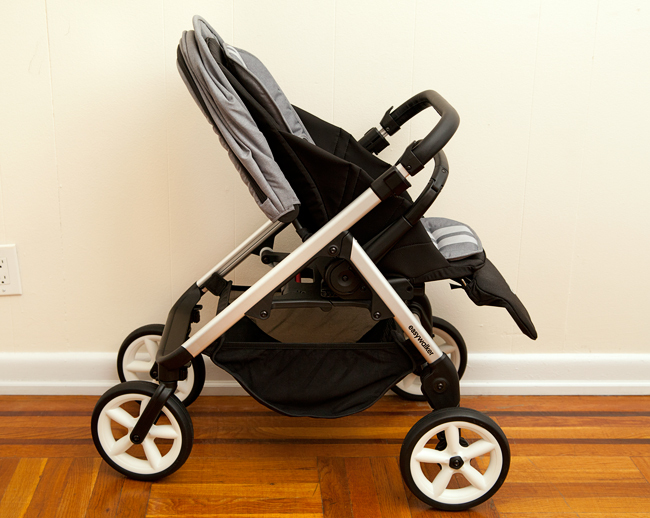 Everything about this stroller exudes quality and durability. Because of a small footprint, slide-in handlebar and excellent one-hand steering, the Mini performs superbly in tights spaces and really lives up to it's name! 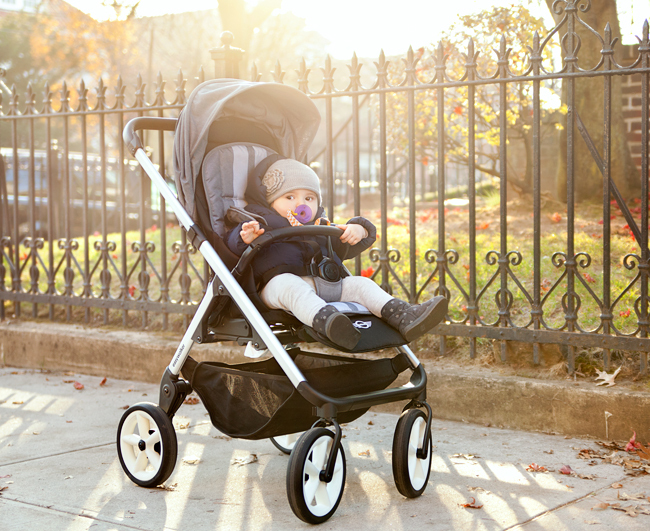 Despite the stroller's petite size, it is packed with smart features for baby's comfort and parent convenience. It is a good option to use from birth due to a reversible seat unit, flat recline, carrycot and travel system options. 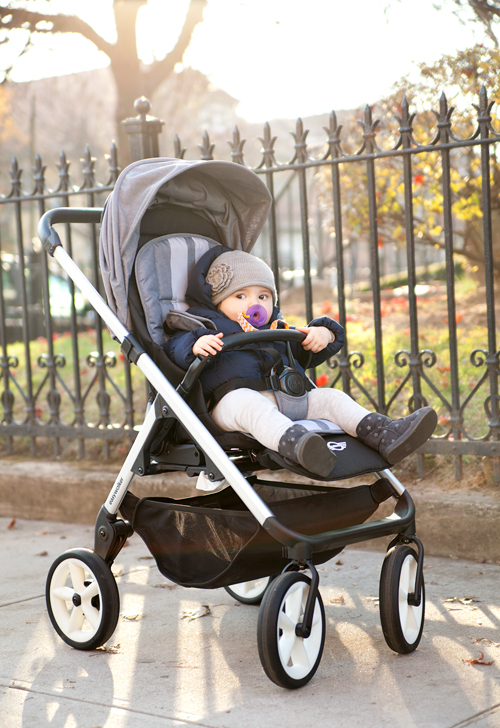 The tall seat back and height adjustable canopy also make this stroller a good fit for toddlers. After using the Mini for a few weeks, I really can't imagine living without it! I would definitely recommend the Easywalker Mini to anyone living in the city who mostly needs a stroller that performs really well on pavement, yet can handle going off road occasionally. 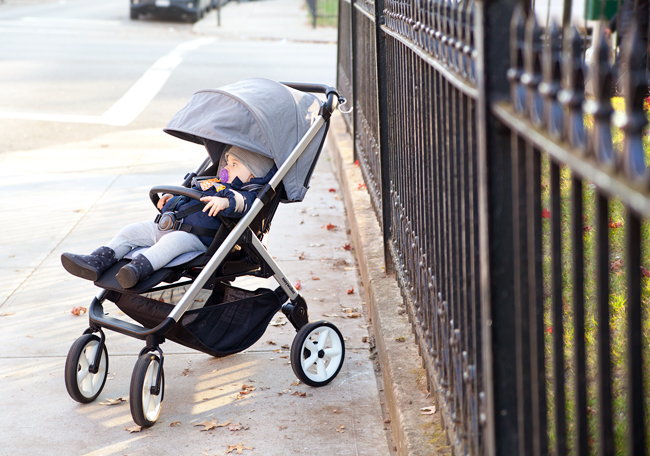 Easywalker Mini checks most of my requirements for a perfect urban stroller. 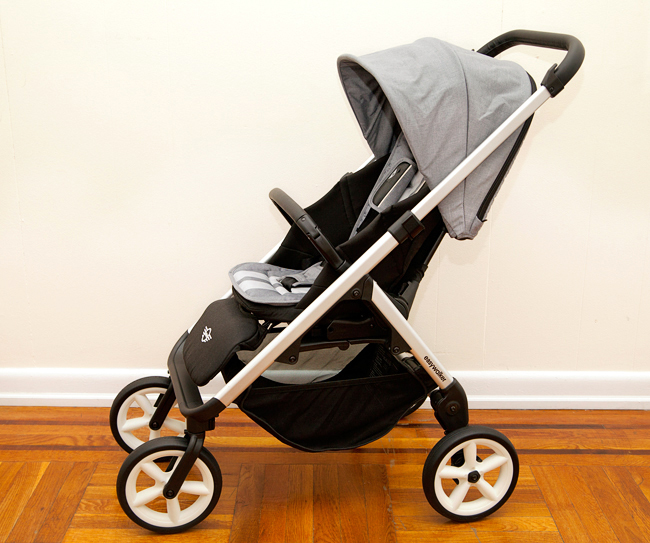 The minor drawbacks really pale in comparison to everything this stroller has to offer. Simply put, Easywalker Mini is one of the best strollers I've had the pleasure of using and I'd like to give it a 5 out of 5 stars rating! 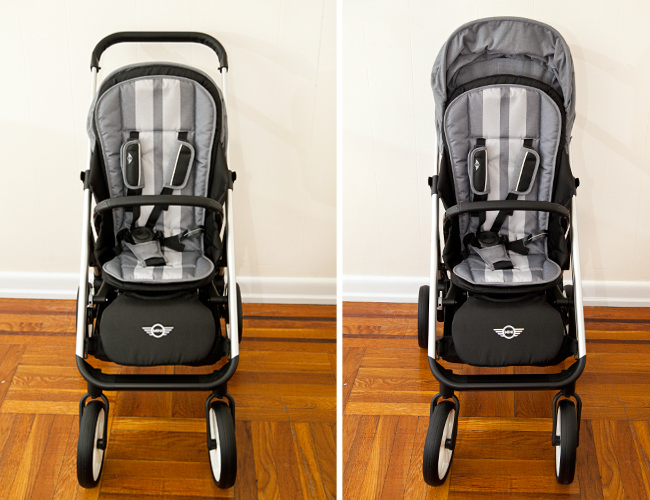 Do you know which car seat this stroller is compatible with? Maxi Cosi Pebble, Nuna Pipa.